The CatMat is the first ever living scratch-and-play surface for your cat. This is a 10 x 20” shallow tray with pre-seeded SureGro mat for just-add-water convenience. 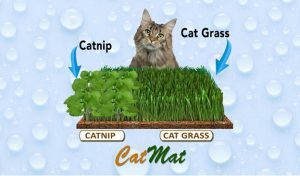 The mat is pre-seeded with high quality cat-grass (wheat, barley and oat) and a special 5” patch of catnip. The CatMat is available with conventional or 100% organic seed.